The elegant Escapade with a Home Theater Sound System including DVD and tracking satellite for TV, features a faux fireplace in the main salon. Two private staterooms, both a convertible couch and convertible dinette, one full and one twin size bunk are on the main level. Move your party to the upper deck where the 6-person hot tub, waterslide, TV, observation counter and second galley with barbeque and fridge are located. A fiberglass hardtop with ceiling fans provides a comfortable arena for cooking and relaxing. 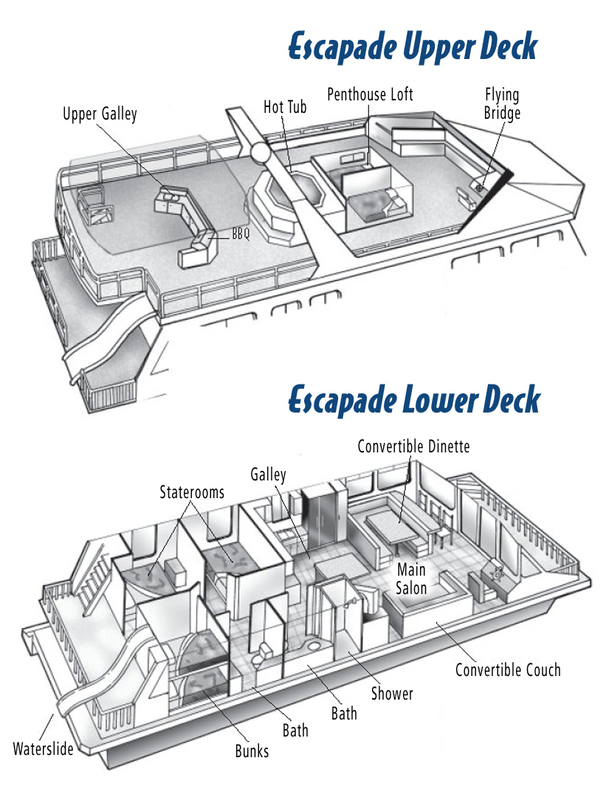 Including the air-conditioned penthouse loft, the Escapade sleeps 15 comfortably(19 max).